Our monthly meetings are held at various venues local to Wimborne, and will normally cost £10 for Members or £15 for Non-Members. Charges for Special Events may vary and will be reflected on the relevant Event Listing on this page. Please register and pay for the meetings that you wish to attend here…. if you don’t have a paypal account, you will also be given the option to pay by debit/credit card. Monthly Meeting - THURSDAY 25 APRIL, 9am - 11am. With Sam Acton, founder of Domestic Angels. 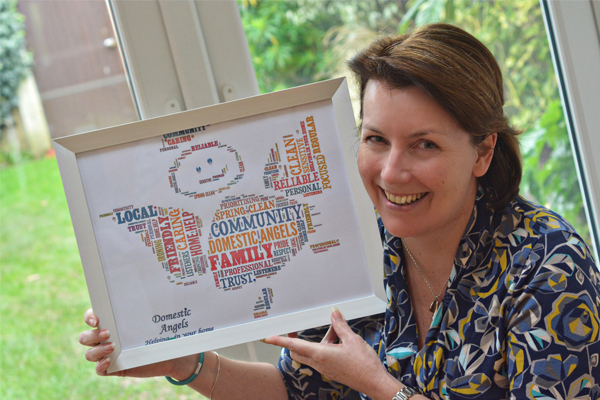 Sam Acton, founder of Domestic Angels. Sam's talk, "Why?" is the story of how Domestic Angels became a household name, why she made the decisions she did, why you might make some of the same decisions and why Domestic Angels are now a software company. BOOK NOW: A fabulous time to catch-up and meet other ladies working in the Wimborne Business Community from a diverse cross-section of local businesses and services. A fun, relaxed and productive time in good company; we look forward to welcoming you. Parking: All town centre car parks within a few minutes walk - closest is Westfield, 80p for 3 hours.